For all but the willfully ignorant, it is abundantly obvious that the population explosion has fueled environmental degradation. 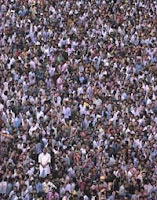 Although some try to argue that population is not the problem, the evidence indicates that overpopulation is directly linked to water shortages, soil exhaustion, loss of forests, air and water pollution. According to an international population and family planning review journal titled Population Reports, unclean water, along with poor sanitation, kills over 12 million people a year. Air pollution kills 3 million more. In 64 of 105 developing countries, population has grown faster than food supplies. Overcultivation, largely due to population pressures, has degraded some 2 billion hectares of arable land. This is equivalent to the combined land masses of Canada and the US. By 2025, with world population projected to be at 8 billion, 48 countries containing 3 billion people will face chronic water shortages. In 25 years, humankind could be using over 90 percent of all available freshwater, leaving just 10 percent for the rest of the world's plants and animals. Half the world population lives on 10 percent of the global land mass. Almost three and a half billion people live on a densly populated coastal strip about 200 kilometers wide and this is damaging coastal ecosystems. Over the past 50 years nearly half of the world's original forest cover has been lost. Current demand for forest products may exceed the limits of sustainable consumption by 25 percent. Since 1950, according to one estimate, some 600,000 plant and animal species have disappeared, and currently nearly 40,000 more are threatened. This is the fastest rate of extinction in human history. Over the past 40 years ocean surfaces have warmed an average of over half a degree Celsius, mainly as a result of carbon emissions from fossil fuel use and from burning of forests. Global warming could raise the sea level by 1 to 3 meters as polar ice sheets melt, flooding low-lying coastal areas and displacing millions of people. Global warming also could result in droughts and disrupt agriculture. Governments and policymakers need to implement sustainable development, and this requires slower global population growth. While the rate of population growth has slowed over the past few decades, the absolute number of people continues to increase by about 1 billion every 13 years, and the environment continues to deteriorate. Steps toward sustainable development include using energy more efficiently; managing cities better; phasing out subsidies that encourage waste; managing water resources and protecting freshwater sources; harvesting forest products rather than destroying forests; preserving arable land and increasing food production; managing coastal zones and ocean fisheries; protecting biodiversity hotspots; adopting a climate change convention among nations and stabilizing population through good quality family planning services. 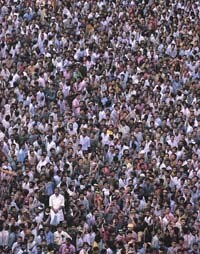 Overpopulation a myth? Are you kidding? It's wall to wall people here in Crowdifornia. We have "road rage" on the freeways. You have to stand in line for everything. The beaches are crowded. Schools are crowded. Parks are crowded. What's the population plan we want? Infinity? Increasing population is driving a whole series of train wrecks.